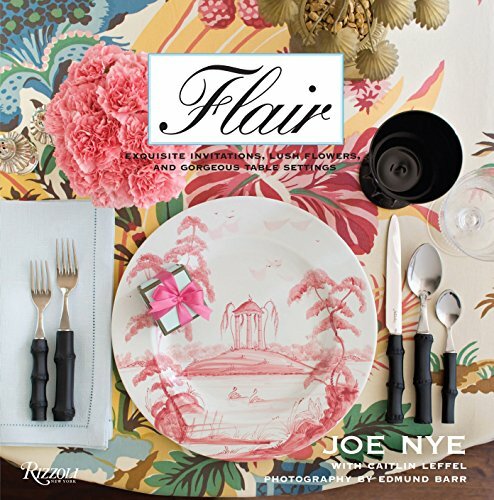 Inspirational ideas for throwing the perfect party from L.A. interior designer and party planner Joe Nye. Clients and friends turn to Joe Nye for his advice on gracious living, in particular how to create a smashing get-together. Flair covers three aspects of party planning that can make an event shine—flowers, paper components, and the table setting. In each section, Nye gives inspirational ideas and tips on how to make the most of these decorative elements for any type of occasion. Beautiful photographs of several diverse settings—a breezy beach cocktail gathering, a casual red, white, and blue patriotic sit-down, a pastel-hued ladies’ luncheon, and an elegant black-and-white supper—show how to achieve winning possibilities that can be pulled off with ease. Nye always throws in fun, unexpected elements, such as serving soup in antique finger bowls from the flea market and personal accents that make for a truly memorable event. The book covers topics such as when to use paper napkins, how to make flowers last longer, and host/hostess etiquette. A shopping resource completes this charming guide for those who relish the joy of entertaining. Neo-traditional interior designer Joe Nye is one of L.A.’s lifestyle gurus, whose many talents include entertaining with esprit. His interiors have appeared in many publications. Nye lectures frequently at garden clubs and women’s organizations around the country. Edmund Barr is a lifestyle photographer based in Los Angeles. Caitlin Leffel is a writer and co-author of two books, including The Best Things to Do in New York.